During GamesCom 2010, Linkin Park's co-lead singer Mike Shinoda realized what it takes to successfully marry music and games, but not before blowing himself up on stage in front of the hundreds of people attending Sony's press event. The members of Linkin Park aren't just a group of guys who are lending music to EA's new Medal of Honor revamp. They're gamers as well, as Mike Shinoda proved by taking the stage to demo Medal of Honor on the big screen during Sony's big 2010 GamesCom press event on Tuesday evening. Shinoda made it through the game level without a scratch, but as the level ended, so did his life. ‘Mission Completed' flashed on the screen, followed quickly by ‘Mission Failed' as the exploding final objective took him out. "I literally blew up the last thing, and then it blew me up right after," Shinoda tells me, sitting down for a brief interview amidst the glowing blue squares that make up EA's expansive media area. "You couldn't have engineered that. I couldn't recreate that if I tried." 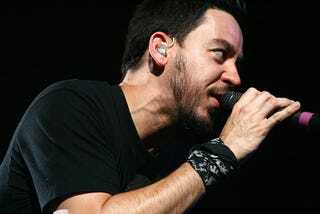 He tells me that the other members of Linkin Park and he grew up gaming. He's a fan of first-person shooters and role-playing games. "Those are my soft spots," he says. Shinoda is at Gamescom promoting Linkin Park's participation in EA's Medal of Honor via the song "The Catalyst," which is debuting on the band's next album, A Thousand Suns, due out September 14 in the States. "We really have made every effort to push the envelope and do something different," Shinoda says. He says the album will challenge many of the band's fans. And it could draw some more in at the same time, now that "The Catalyst" is closely tied to EA's next big shooter. From the Journey Escape game for the Atari 2600 to Eminem's latest showing up in Activision's Call of Duty: Black Ops, the relationship between the music and video games has steadily evolved from trite tie-ins to something more meaningful. At least that's the general idea. Tacking a song onto a video game is easy enough, but creating something special via the merger is another thing altogether. Like any relationship, the one between music and video game cannot be forced. "Being here today," says Shinoda, "I'm realizing that the times when it works the best is when it's honest, and when it's not a forced relationship. If you truly like to play a certain type of game, or you're a fan of a title and you get to collaborate with them, then that's when it's the best." And that's the sort of relationship he believes his band has formed with EA. "If you look at our videos and you look at the trailer that Joe Hahn created for Medal of Honor, it doesn't seem out of place at all. It fits right in with what he does and what we like. It seems to fit pretty well. " I'd like to personally thank Mike for his time, and for not laughing too hard when I responded to his question, "Do you play music?" with "Well, I own a guitar."